My favorite color, for my entire life, has been purple. So when I was picking our wedding colors, it was a no brainer. I wanted eggplant, and I'd add in lilac and silver just because you're really supposed to pick a trio of colors instead of one. I wanted my girls to wear champagne dresses -- and then I realized that if my color scheme was purple, their dresses should be purple. Pete didn't care, just as long as I didn't pick black. These are all the little things that you have to decide. 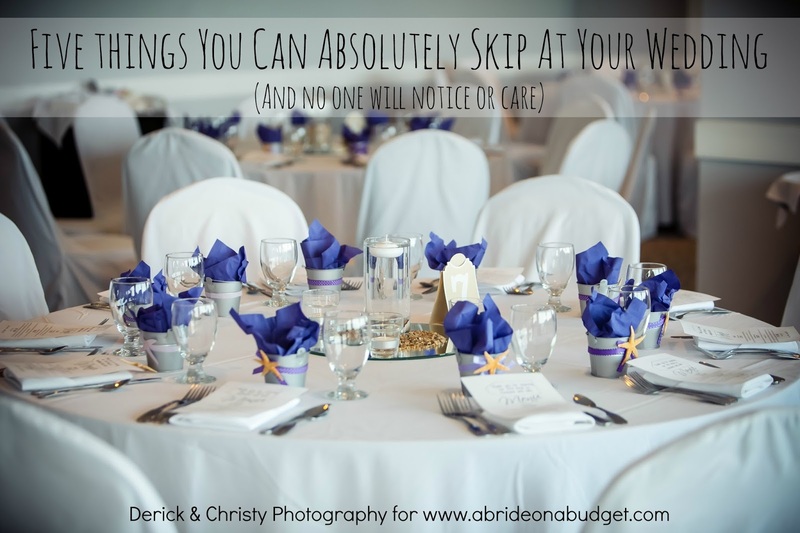 No one comes and says, "These are your wedding colors. 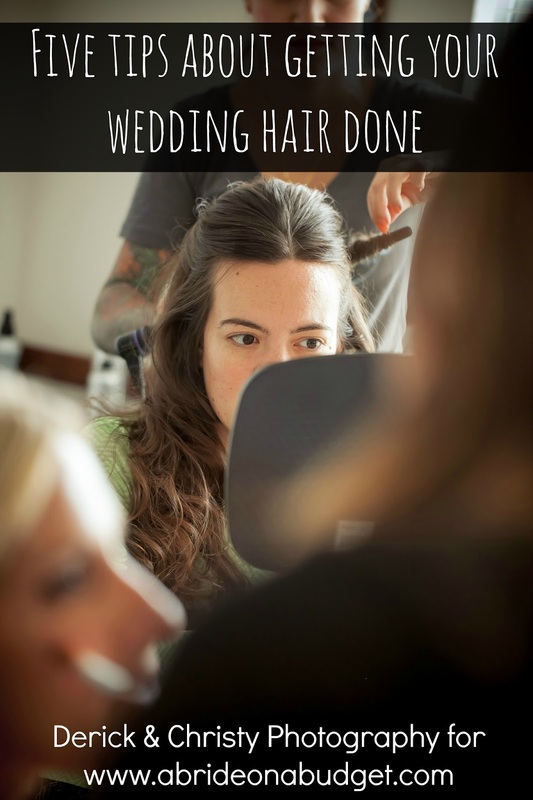 Here are dresses for the bridesmaids and matching ties for the men." But once you finally do decide on the women, it makes picking items for the men easier. 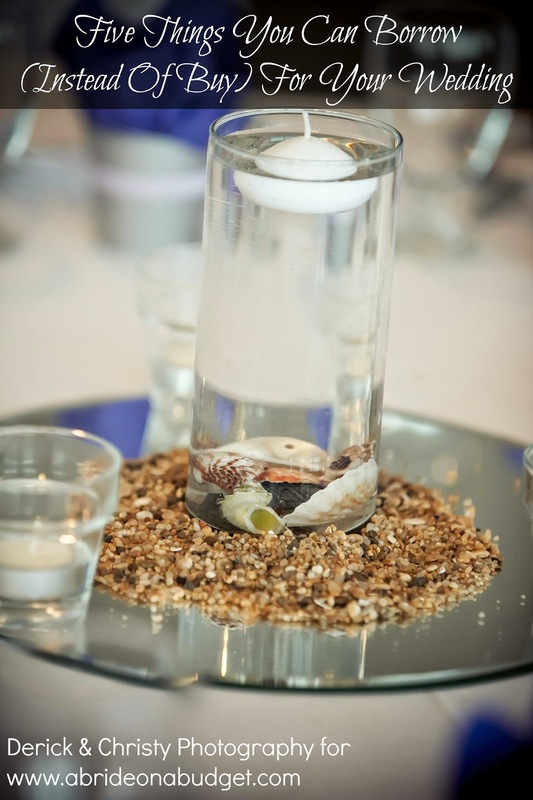 Some of those items, you can actually give them as groomsman gift. I actually think wearable groomsman gifts are great ideas, especially if they're something they can wear in the future. There's a good chance your groomsmen are going to wear ties with their suits. Pete wore a bow tie and his groomsmen wore long ties. It was a nice way for him to stand out while wearing the same outfit as everyone else. You can shop online where you can shop by color, pattern, size, and more. That's a great way to assure you are choosing a tie that will fit into your color scheme. 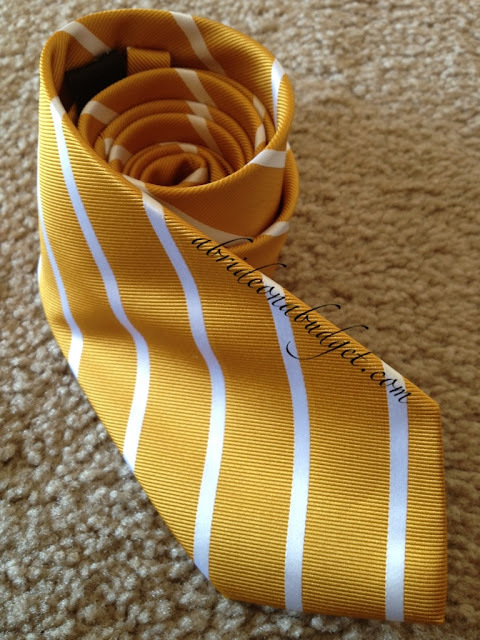 If your groom has a favorite sports team, you can also pick up sports ties. Or ones with comic book heroes. Try to add a little personality into your wedding, but make sure to pick something the groomsmen can wear after the wedding is over. I wanted to say ... watches are so timeless, but man, what a bad, unintentional, play on words. I do love a watch as a wedding gift idea though. I actually made the one in the pin above for Pete. Of course, if you're giving watches as groomsmen gifts, you aren't going to sign them - your (almost) wife, but you can add a cute card with them or a funny note. Belts are so useful. I used to wear a different one every day, just to accessorize. I stopped when my style changed a little, but that means Pete has inherited my excessive belt collection. He combined it with his, and now he has a ton to choose from: including the one he wore on our wedding day. Some of his groomsmen wore belts too, but I'm not sure if they all did. You can assure they all do by picking out a belt as a groomsman gift. 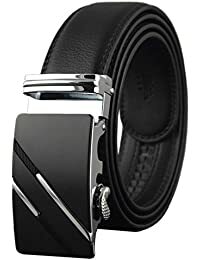 They'll be sure to wear that for years, especially if you pick up a black or brown belt. We are big fans of sunglasses. I can't even begin to try and count to figure out how many pairs we have between the two of us. One of Pete's favorite pairs is actually made from a skateboard deck. They're so cool. Pick up a few really cool pairs as groomsmen gifts and they'll be sure to wear them all the time. 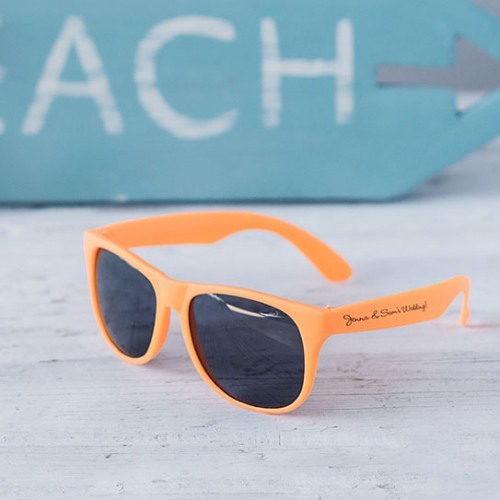 If you really like sunglasses, you can actually purchase personalized sunglasses as a wedding favor. They're perfect, especially if you're having an outdoor ceremony. Pete loves funky socks. 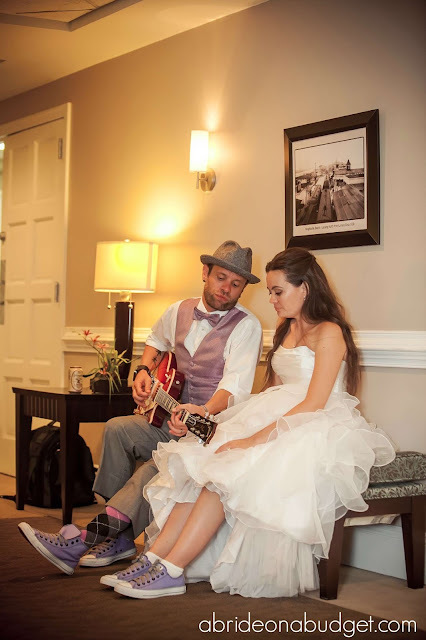 I buy him a pair every year for Christmas, he permanently borrows mine, and he wore a really fun pair on our wedding day. I wish that we had gotten cool pairs for all his groomsmen. You can actually pick up monogrammed men's socks in a variety of colors. You can choose them to match your wedding colors, then be assured the groomsmen will wear them. Because who doesn't want a pair of socks with their initials on them (or a three letter nickname). Pete would love them. When we got married, we told the groomsmen they could wear any shoes as long as they were black. Pete, however, wore lilac Converse -- and of course, I wore them to match. It was such a cute touch. He wears those shoes every time he wears his suit now (you can also actually see his funky socks in that photo too). 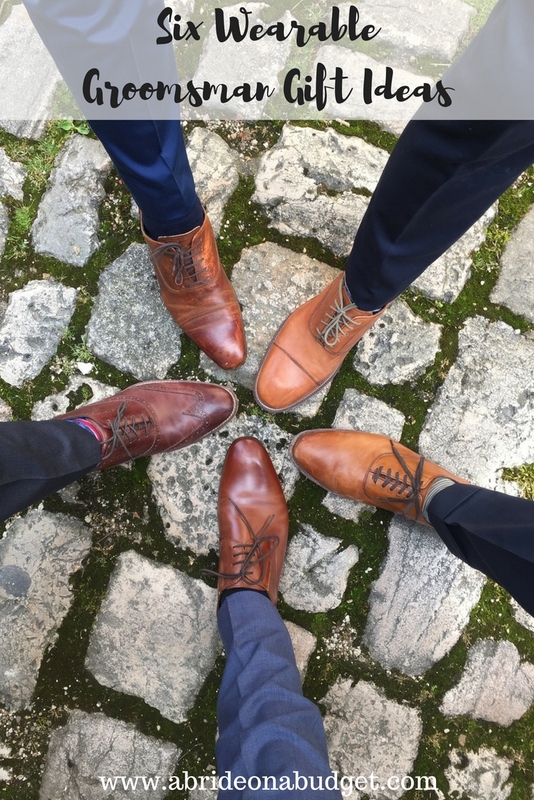 If you want your groomsmen to have a little more style, picking out shoes for them is a great gift idea. You can even personalize them with text on the back like we did. Just be sure to get their shoe size as soon as possible to you have time to design and order the shoes. 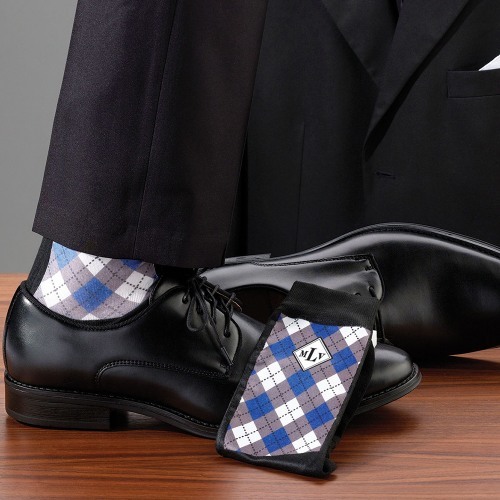 BRIDAL BABBLE: Which of these wearable groomsman gift ideas is your favorite? Thanks for the nice comment on my photos. I am definitely impressed with how they came out. The tie is really thick and stiff, so I think that helped the photos!